Polish and Israeli governments meet, sign joint declaration of cooperation on water supply and sustainable energy technology management policy. DFM Ayalon with Polish Minister. On Thursday, inter-governmental consultations took place between the governments of Israel and Poland. The consultations included a meeting between Israel's Prime Minister, Binyamin Netanyahu and Polish Prime Minister Donald Tusk. 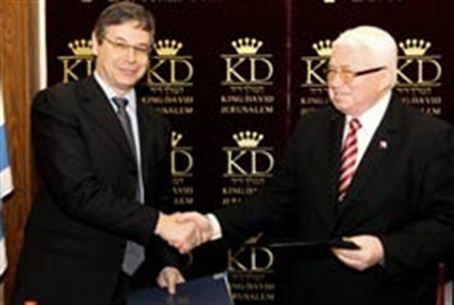 Within the framework of the meeting, several agreements were signed by Israeli ministers and their Polish counterparts. Among these was the joint declaration regarding cooperation on water supply and sustainable energy technology management policy signed by Deputy Foreign Minister Danny Ayalon and Polish Minister of the Environment Bernard Blaszczyk. The declaration is concerned with the planning, defense, development and mobility of water sources and sustainable energy, with an emphasis on bilateral cooperation for the benefit of the citizens of both countries. The cooperation is primarily in the realms of promoting investment, exchange of technologies, increasing dialogue and exchange of information, and the establishment of uniform standardization. Cooperation will be in the form of rotation of specialists - both professionals and technicians - and will include reciprocal learning tours, joint projects and research, training courses, exhibitions and workshops. In addition, cooperation between private entities will be increased. At the conclusion of the meetings, Netanyahu made a statement in which he thanked Tusk for his country’s friendship. “As Prime Minister, I have the great privilege of counting you as a personal friend, and Poland, too, is a real friend to Israel,” said Netanyahu.